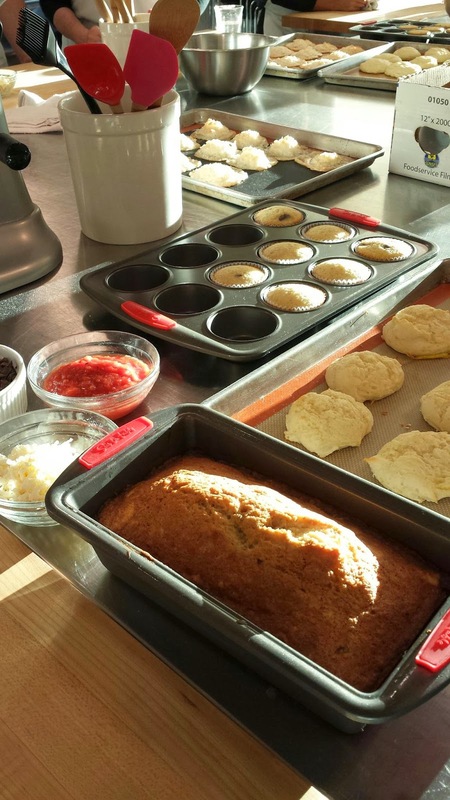 My mom and I recently took a gluten free baking class at Sur La Table. We baked banana bread, biscuits, chocolate chip muffins, coconut macaroons and pizza. The pizza and macaroons turned out to be disappointments which was unfortunate because we were really looking forward to learning a good gluten free pizza crust recipe. The biscuits and muffins were great recipes. We both thought the texture was very similar to “normal” biscuits and muffins. These recipes also allowed you to switch it up! You could easily add fruit instead of chocolate chips to the muffins and herbs to the biscuits. It was also great to exchange tips and ideas with the other students. My mom and I really enjoyed taking the class together, so if there is a Sur La Table near you, check out the class schedule! The instructor also told us the French macaroon class uses a gluten free recipe. Next ›Gluten Free Trip to New England!